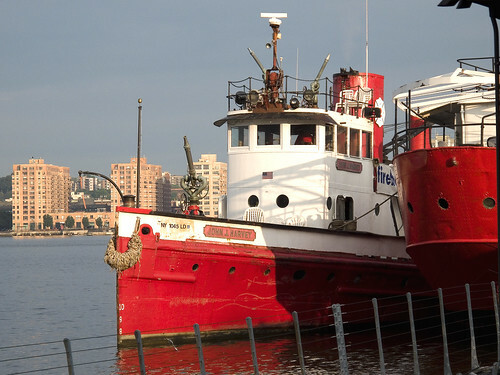 On July 3rd of 2009, I was invited to ride along on the Fireboat John J. Harvey as it made its way “up” the Hudson River to take part in the July 4th celebrations of the City of Poughkeepsie. Onboard, along with its crew, were a gaggle of photographers and antiquarians. 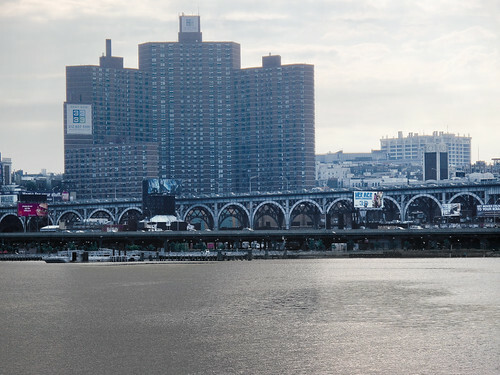 Members and directors of the Working Harbor Committee, the Newtown Creek Alliance, and notable individuals such as maritime photographer Jonathan Atkin and Tugster’s own Will Van Dorp. 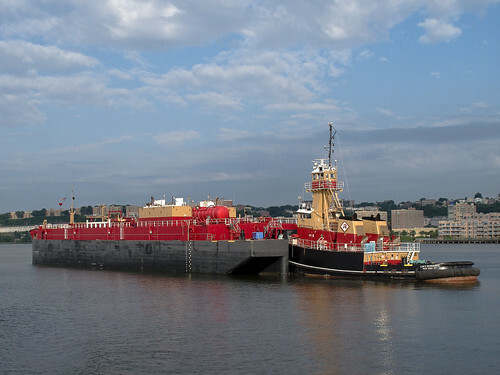 We boarded the Harvey at Pier 66 in Manhattan, where it shares its berth with other historic vessels such as the Frying Pan. Before we even left the dock, the show on (what Will Van Dorp has christened) the sixth borough began. 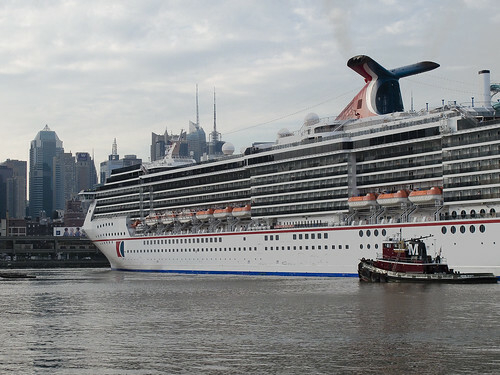 The Tugboat Miriam Moran was guiding the Cruise Ship Carnival Miracle (call sign H3VS) up the Hudson from lower New York Harbor. The Miriam Moran is a 149 ton ship that was built at the McDermott Shipyard in Amelia, LA in November of 1979. The Carvival Miracle is an 85,942 ton ship which carries 934 crew members and up to 2,667 passengers which use 12 elevators to reach its 3 restaurants, 4 swimming pools, and 12 decks. 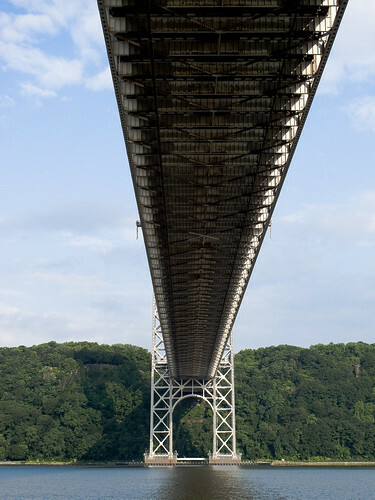 Its 963 feet long and flagged in Panama, and was built at the Aker Yards in Norway in 2004. Miracle cruises at a maximum ocean going speed of 22 knots. Some sort of controversy erupted onboard the ship a couple of years ago because of a change in itinerary due to Hurricane Hana, resulting in “the miracle riot“. Just a little zoom-in for the Miriam Moran, with New Jersey in the background. For more on the McDermott Shipyards, which built the MM, click here. As the Harvey got underway, the weather was definitely not with those of us with cameras in our hands. 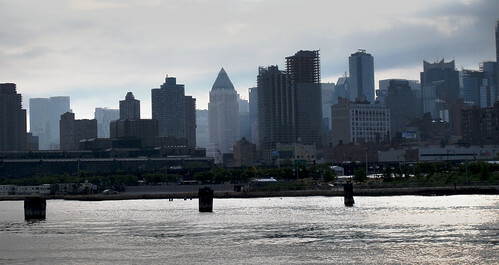 A misty morning typical of the turbulent atmospherics experienced by New York City in the early summer of 2009, there was a hanging mist in the air. 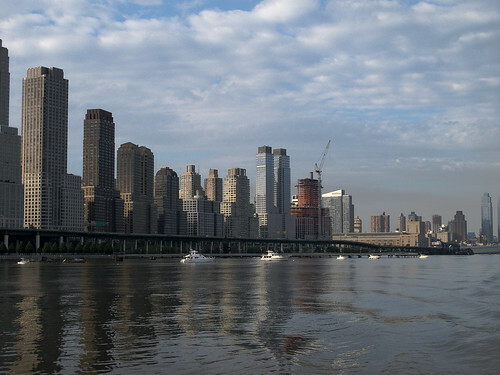 Also, it was just after 7AM, never a good time for shooting on the west side of Manhattan. Centered in the shot above is the Worldwide Plaza, which is a building I used to work in when it housed the advertising agency Ogilvy and Mather in the late 1990’s and early 21st century. 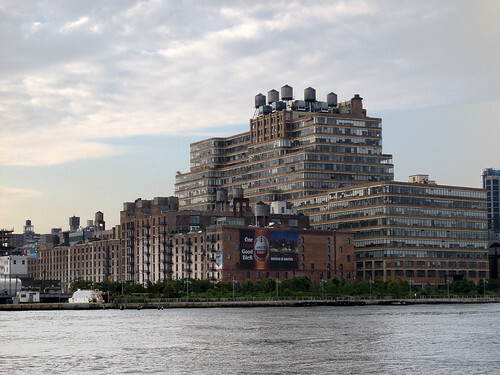 The Starrett Lehigh building is an enormous (former) warehouse built to accommodate the thriving rail trade of the early 20th century, and can be found at 601 West 26th Street between 11th and 12th Avenues. Built by the Lehigh Valley Railroad, the SL building had railroad tracks leading into its ground floor, but has had its rail and dock links severed. 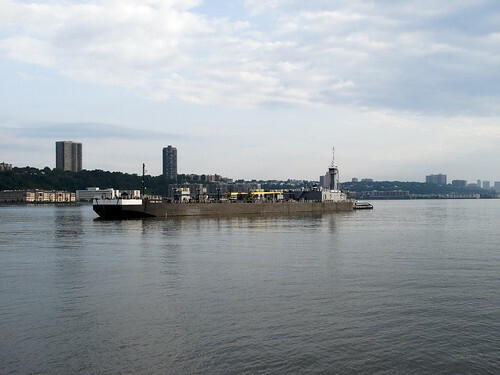 Once, the railroad would load barges with railcars, and float them across the Hudson to Manhattan tracks which would use Diesel engines to pull them into the building. As the Harvey’s engines began to gather speed, the vast shield wall of the Manhattan Midtown Megaliths began to roll by. Until quite recently, in the area below 34th street and above Canal Street, Manhattan used to be at a relatively human scale. This is why the cultural and artistic communities of New York City agglomerated in this area. The building boom of the last 20 years, however, has continued to follow the debauched urbanist philosophy of vertical separation twixt street and citizen, and is part of the reason why Manhattan is just not fun anymore. Its easy to screw the working class if you live or work in a rarefied atmosphere high over the city- your fellow citizens appear to be ants and you might as well treat them as such. 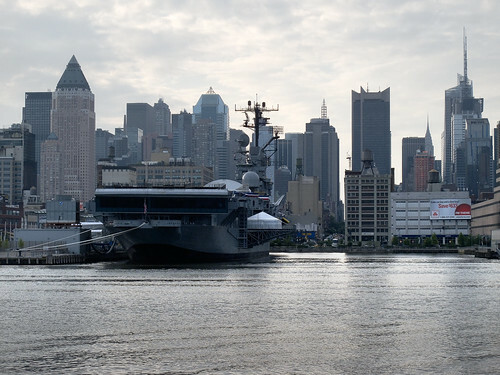 The USS Intrepid has returned to its pier at 42nd street, after repairs were mandated and the great ship was drydocked in Bayonne at the former Miltary Ocean Terminal. Incidentally, does anyone else see the irony in the memorial erected by the Russian Federation for the September 11 attacks. The “Tears of Grief“? “Russian tears” is an ironic euphemism, to me- like “with russian efficiency”. Nothing against our former mortal enemies, but Russians are not a people known for their “touchie feelie” politics. It was very nice of them to send us a statue, though. Miriam Moran completing the docking of the Miracle at its destination pier, right next door to the Intrepid. 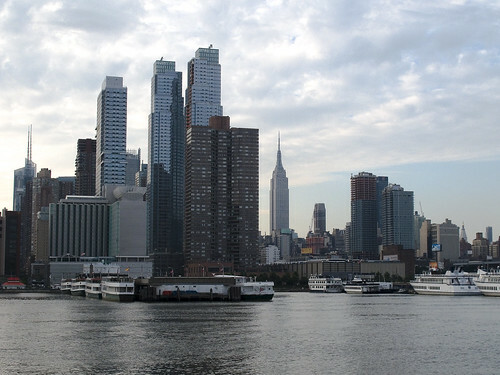 Piers 88,90, and 92 are collectively the New York Passenger Ship Terminal– a 70 year old complex that is desperate need of retrofitting to accommodate the larger Cruise Ships now in demand by the global market. 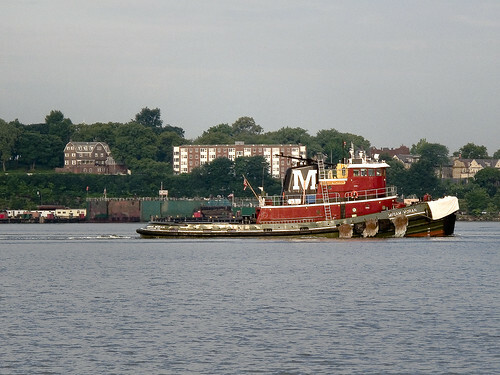 Penn No.6 Tugboat and its fuel barge. A 580 ton tugboat, built in Pensacola Florida at the Southern Shipbuilding yards in 1970, it has been known in past incarnations as the “Robert Alario” and the “Morania no. 6”. It is owned and operated by Penn maritime. Click here for a zoomed in shot of the Penn no. 6. Another of Robert Moses’s pet projects, the 79th street boat basin has been providing the upper crust with a manhattan berth since 1937. The only location in Manhattan for a year round residency on a houseboat, Roy Cohn and Frank Sinatra both used to maintain addresses here. One can only hint at the hidden things that transpire here. What transactions are conducted by the ruling class in an isolated aquatic plutocracy just off the coast of Manhattan? “MAY MCGUIRL”, “MORANIA NO. 5”, and the “TEXACO DIESEL CHIEF”. It was built at the Jakobson Shipyard, and is 200 tons. For a photo of it in a previous incarnation, visit this link. Last shot of Manhattan as we continue north on the Harvey. This is somewhere around 125-150 street. 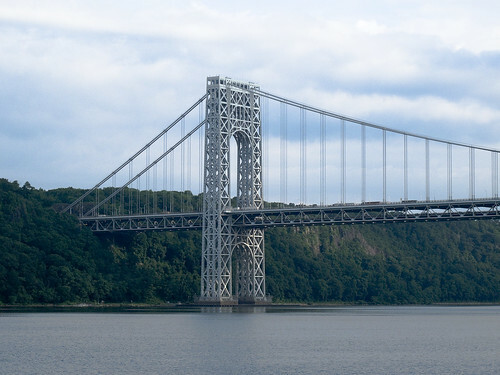 The George Washington Bridge, Manhattan landing. 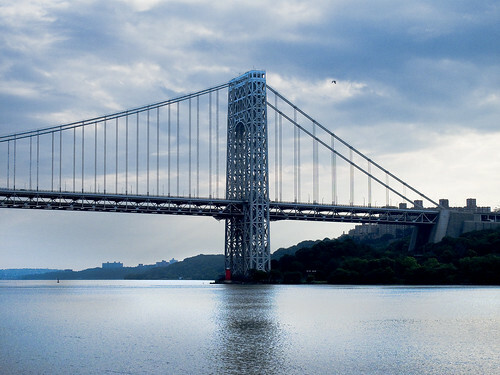 Down under the George Washington Bridge, aka DUGWO. Goodbye megalopolis, and the lower part of the Hudson River that atavists and extant maritime notations refer to as “the North River“.